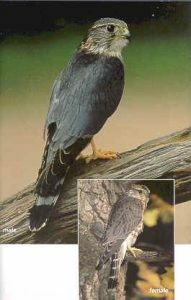 Comments: Merlins are pigeon-sized falcons with facial markings much less distinct than other falcons. The backs of females and immatures are dark brown while males are slate-gray. Their breasts are boldly streaked and their tails have broad, dark bands. Distribution: Merlins are highly migratory. Some winter as far south as Peru. In Kansas, merlins are an uncommon visitor during the fall, winter and spring. They breed in Alaska, Canada and along the northern border of the United States. Food: Their main food consists of small to medium-sized birds. Occasionally they will take small rodents, reptiles, amphibians and insects. They hunt from perches, low level flights and by surprise attacks by stooping from higher elevations. Sometimes they fly into the midst of a flock of small birds to try to get a bird to break away from the flock, making it an easy target.